The Saddle Club has finished shooting its third season in the Central Victorian region of Porcupine Ridge, north-east of Daylesford. More than 70 cast and crew have spent six months in the region, providing an economic boost for the district. An Australian-Canadian co-production, the 26 part series is screened in 300 channels in the United States and throughout Europe and the United Kingdom. On what must have been an emotional shoot for everyone, the series was not without its dramas. Guitarist and composer Carl Dixon, the father of cast member Lauren Dixon (Stevie) suffered a major road accident in April. He was returning from a studio where he had been working on series at the time. On his official website, Dixon tells fans of a slow but steady recovery from multiple and extensive injuries. Last month, The Saddle Club lost a previous cast member, Jessica Jacobs, 17, in a tragic rail accident. Jessica was a promising actress, who played the role of Melanie Atwood in season 2. 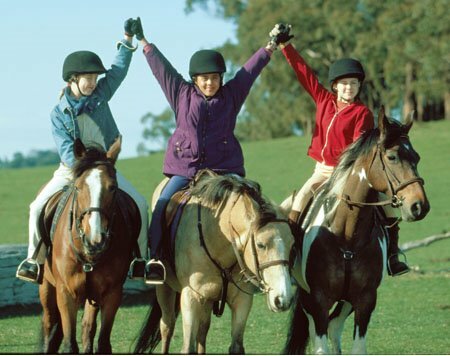 The first two series of Saddle Club (pictured) ran from 2001 – 2004 on the ABC, but was renewed and re-cast in 2008 under Crawford Productions and Canada’s Protocol Entertainment. I don’t track DVDs but I doubt its avail before it screens. Try JB HiFi or Saddle Club merchandise on its own site. My young daughter cannot wait for the return of Saddle Club Series three. Does anyone have an idea as to screening time on TV and particularly selling timefames in the stores please? Yes, and also The Saddle Club had a large fan base already as the show is based on a series of popular books that are available world wide. There’s over 100 books in the series. TGYH isn’t available in novel form, so far as I know…. To American audiences especially the improv comedy thing isn’t exactly new. how can the saddle club work internationally.. and not thank god you’re here..?? baffles me.